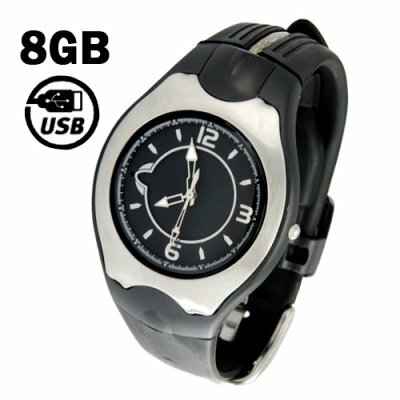 Successfully Added USB Watch - 8GB Flash Memory Timepiece to your Shopping Cart. Classic style 8GB USB flash drive built into a fully functioning and stylish analog watch. This one of a kind flash memory watch not only has a huge 8 gigabytes of storage, but also contains the USB cable you need to attach it to your computer! The built-in USB cable is conveniently tucked into the watch strap, ready to be pulled out whenever you need to attach it to your computer. This convenient feature makes this watch seem like the worlds easiest to use micro HDD since it allows such quick and easy transferring and carrying of digital files. If you want maximum portability and ease of storage for all your often used pictures, digital media, slide presentations, spreadsheets and other data such data, then this is the "super geek" apparel that you need! The CVSC-218-8GB not only looks great, but has immense practical uses for you or that special someone in your life. Whether you are getting this for yourself or plan to resale this highly popular device on your internet storefront, you will find that this is both a profitable and easy to sell device because of its uniqueness, along with Chinavasion's always in stock warehouse, blind dropshipping, and included one year warranty. Don't wait any longer, order your stock today!